Good afternoon from the team hotel, which is in walking distance of Amalie Arena. On a 75-degree day in the middle of Feburary, that’s not an awful combination. -There didn’t appear to be any changes from the lines shown yesterday. On the defensive end, Paul LaDue’s debut may have to wait at least an extra game, if the order of the defensive rushes were any indication. The first seven rushes were: Forbort-Martinez, Muzzin-Doughty, McNabb-Gravel, Forbort-LaDue, Muzzin-Martinez, McNabb-Doughty and Gravel-LaDue. Jonathan Quick skated, though Peter Budaj and Jeff Zatkoff were more active in their respective creases. Again, there’s no acceleration in Quick’s timetable. “He’s on his schedule and he gets another five-day break coming up, so it’s a pretty good schedule for him,” Darryl Sutter said. -Jordan Nolan, who was placed on injured reserve yesterday, is out with a muscle pull. 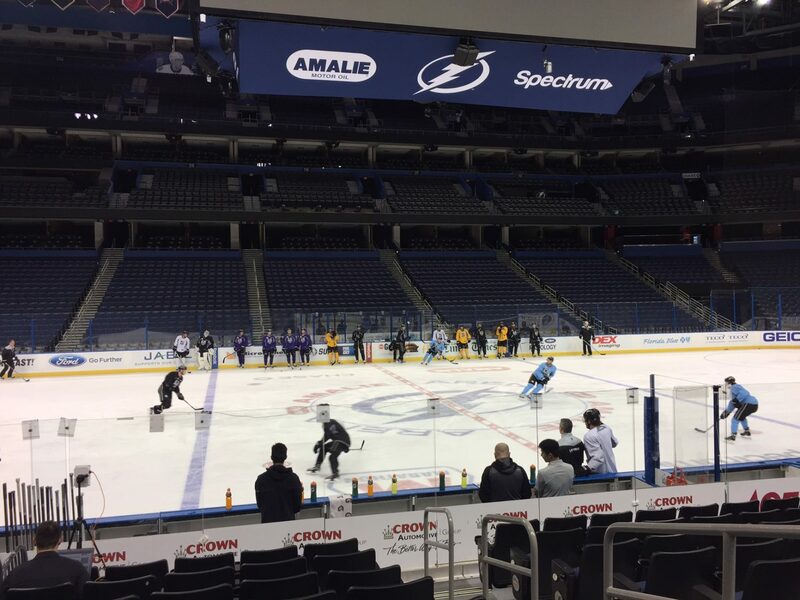 Though he’s “day-to-day,” per Darryl Sutter, he has a minimum seven-day injured reserve stay and won’t fly across the country to join the team on this trip. -I spoke with Bob Miller while the team was getting ready to get onto the ice, and he was in very good spirits. He’s been watching the games on this trip and was able to spend some good time at home last night watching the Super Bowl with his wife, Judy. He has additional appointments coming up, but there’s not much to share beyond that; for more on Bob, Tom Hoffarth of the Daily News had an update on Friday. -In recognition of LGBTQ support and awareness, and to fight homophobia in sports, the Kings are hosting Pride Night on February 16 against Arizona. Tickets purchased through this link will include a commemorative Pride Night T-shirt, and a portion of the proceeds will benefit the You Can Play Project. This month, each NHL team has chosen one player as a You Can Play ambassador; for the Kings, that player is Dustin Brown. “It’s just bringing awareness to it,” Brown said of his role as the club’s ambassador. “I have friends that are needing support and it’s just something that’s becoming more and more important in society.” After today’s Darryl Sutter quotes, I’ll have a story up on Brown’s role in this platform. The league also recognizes February as Hockey is for Everyone Month in an effort to promote and facilitate diversity throughout the sport. For more on each team’s You Can Play ambassadors, click here. The NHL's Third Star of the week leaves the ice after practice in Tampa on February 6.